One requirement of is that it should be of the same size of the message. Otherwise, there are not enough bytes to XOR with, and part of the message is revealed. But the other, more subtle but still fundamental, requirement is that each is used only once. Understanding why this second requisite is important is the scope of this article. If the same key is used more than once, bad things will happen and you will go to hell. As soon as you have encoded a message with a given pad, throw it away immediately and for good! The one time pad is so simple that one little bit of carelessness can break it! where in the last line we have used the fact that the XOR is a commutative operator, and that . But behold! Given only two cipher-text, we retrieved a combination of the original plain-text messages! We may have not recovered the original messages yet, but we don’t have too long a way to go. For the sake of simplicity, let’s assume that plain-text messages are made up only of letters (both lower and uppercase) and spaces. What is needed just one stroke of genius. The question we now need to ask is: what happens when two characters from the plain-texts are XORed together? The crucial part is the last line of the table. When XORing a space with any of the upper/lowercase letters, a number is obtained. I will treat messages as arrays: the first char of the first message will be , the second char of the second message will be , and so on. So it seems we can pretty confidently assert that is a space. But since is known, we can easily recover as well! And, of course, we can do the same with . Boom! 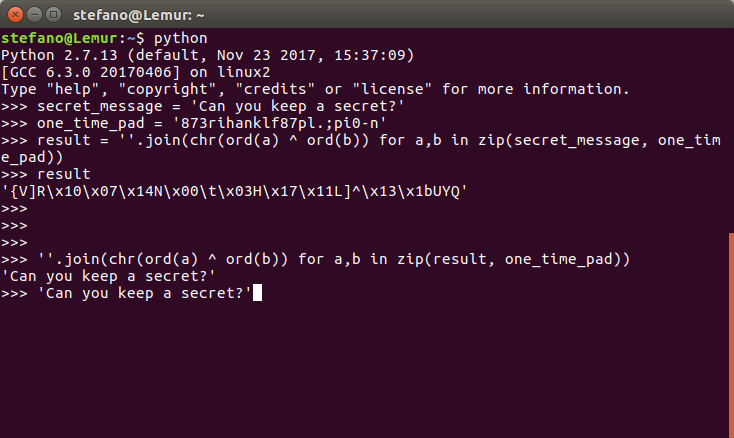 If we intercept enough ciphertexts, all encoded with the same one time pad key, then it’s likely that there will be enough spaces spread throughout all columns that would allow a fair amount of decryption with this method. Even if that would not be the case, enough spaces would probably be present to assure at least a partial decryption, that may then be completed by hand. It is surprising how much one can do with seemingly useless information. It becomes clear now why cryptographic protocols should never leak any information whatsoever! The many time pad vulnerability is pretty powerful. It is not difficult to understand, and not so difficult to implement. Below is an almost-working Python code that you may draw inspiration from. if guess == SPACE: #we can use the space to recover one key char and decrypt the whole column! This entry was posted in IT, Security and tagged cryptography, hacking by TheCrowned. Bookmark the permalink.